Maj. (Dr.) William Scott, 99th Surgical Operations Squadron general surgeon, performs surgery using the da Vinci Surgery System at the Mike O’Callaghan Military Medical Center, Nellis Air Force Base, Nev., April 3, 2019. The console provides the surgeon with a magnified, three-dimensional view of the surgical site as the tower sits over the patient and performs the operation. The da Vinci is a robotic surgery system that enables surgeons to perform complex procedures with heightened precision and accuracy. 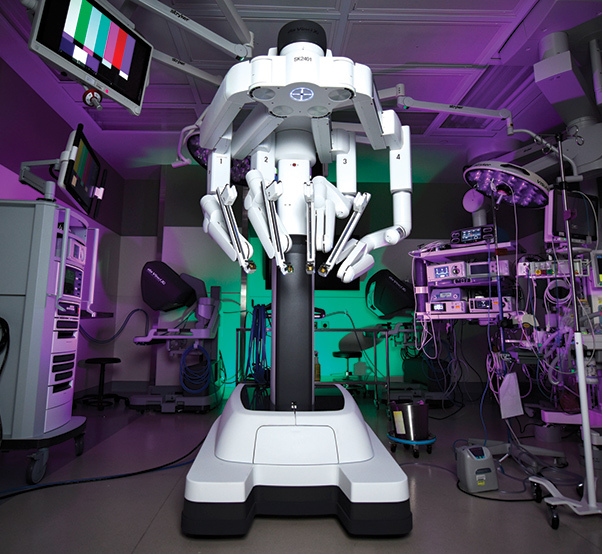 The system is comprised of a tower and console, designed to expand the surgeon’s capabilities and promote efficiency. The surgeon sits at the console and uses controls to operate the robotic arms on the tower. 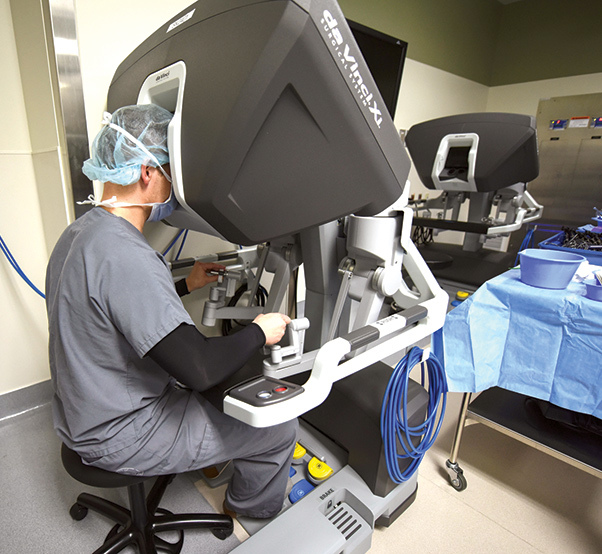 The console provides the surgeon with a magnified, three-dimensional view of the surgical site as the tower sits over the patient and performs the operation. The da Vinci Surgery System awaits its first surgery at the Mike O’Callaghan Military Medical Center, Nellis Air Force Base, Nev., April 3, 2019. The MOMMC hopes to integrate the da Vinci into many more surgeries. 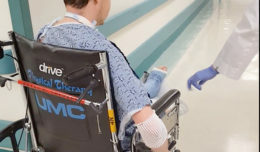 By minimizing incisions, surgeons can reduce the amount of trauma to the body, leading to less pain, shorter recovery times and fewer complications for the patients, said Scott. 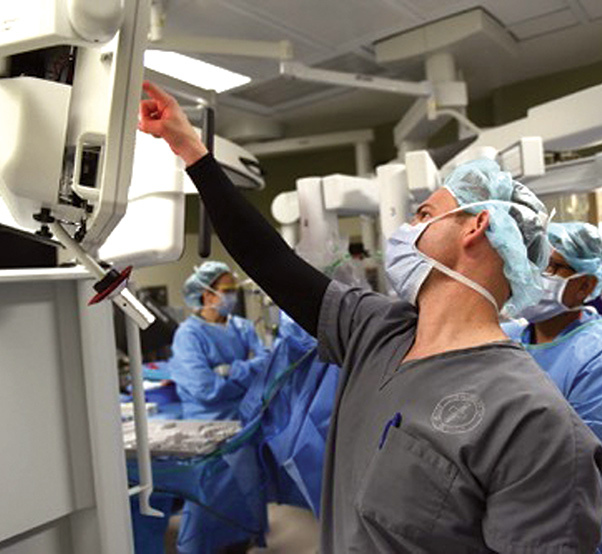 The training and overall knowledge gained through robotic surgeries will provide the hospital staff with the experience needed to become a more proficient force, said Scott. For more information on the da Vinci Surgery System, call the General Surgery Clinic at 702-653-3050. Maj. (Dr.) William Scott, 99th Surgical Operations Squadron general surgeon, points to a screen to show a trainee how the da Vinci Surgery System works while performing surgery at the Mike O’ Callaghan Medical Center on Nellis Air Force Base, April 3, 2019. The da Vinci was used to perform the surgery, allowing the patient a faster recovery time. Majs. (Drs.) 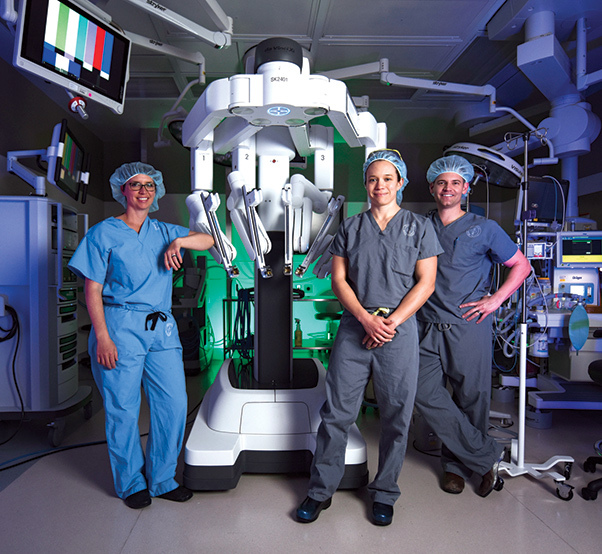 Megan Bing, Rachel Nemcic and William Scott, 99th Surgical Operations Squadron surgeons, stand next to the da Vinci Surgery System at the Mike O’Callaghan Military Medical Center, Nellis Air Force Base, Nev., April 3, 2019. Scott said the da Vinci is beneficial for surgeon satisfaction and the overall readiness of the 99th Medical Group.